Here are directions on how to connect a Smartphone to a car radio to enhance listening to Internet radio while driving. A more costly connection is Bluetooth Audio, but if you are not ready to buy a new car stereo this is an inexpensive solution. 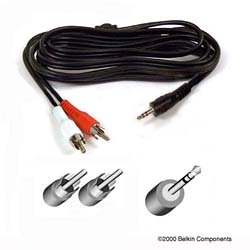 *3) auxiliary input adapter for my Pioneer car stereo (connects to IP-BUS back side of stereo)—ebay $10 shipped *This item is not needed if your car or home stereo already has RCA inputs. Now I can connect my Q (Smartphone) to my car stereo and voila!! I am now streaming cd quality audio through TCPMP to my car stereo for just over $20 in parts!! Not to mention being able to play any music on my storage card.